This season, give the gift of local gardening! Check out our round-up of some of the most thoughtful, appropriate Iowa gardening gifts around, then double-click your way through your Christmas list! I wrote this book with the Federated Garden Clubs of Iowa; it's published by the University of Iowa Press; and a small portion of the proceeds go to Reiman Gardens in Ames. It doesn't get much more Iowa than that! 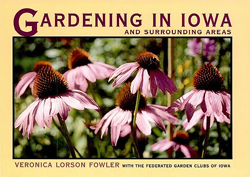 "Gardening in Iowa" is the perfect gift for a new gardener, someone just moving to Iowa, or a long-time gardener who always likes new tips and tricks. The book is broken down, month-by-month, with helpful articles on everything from starting seeds indoors in early spring to the best methods of composting in late autumn. Softcover. 176 pages. Wood-cut illustrations. $21 plus $5.50 shipping and handling. Order by December 17 to assure Christmas delivery. (And I'd be delighted to write an inscription in the book for you, if you request it!) Click here to find out more or order. Check out this delightful children's book about the value of community, sustainability, social responsibility, and seeking alternative possibilities. Written for ages 7 - 11 (and precocious adults!) by Des Moines author Linda Mason Hunter and Susan Summersill. Personalized inscriptions available. $18. Click here to find out more or order. 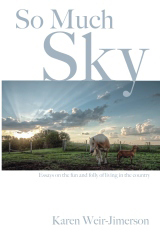 Friend and Country Gardens magazine columnist, Karen Weir-Jimerson, has a lovely book out: "So Much Sky." An accomplished gardener and wonderful writer, Karen writes about life on her acreage near Woodward. It's full of wise, funny observations about gardening, nature, family, and the passage of time. The book is $16.00 plus $1.95 for postage. Click here to order or call 515-343-9670 during business hours to put it on a card. Karen will even sign it with the inscription of your choice! 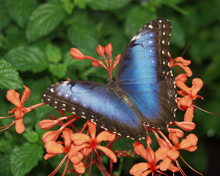 Support your local public gardens AND give the gift of enjoying beautiful flowers and butterflies. A basic membership of just $55 gives free admission all year 'round for households/families as well as grandchildren under the age of 17. Best of all, with Reiman's beautiful butterfly wing and large conservatory with pond and waterfall, you can enjoy this gift all through the winter! Click here for membership details. Support Iowa's living library of trees with a holiday gift, either in the form of a gift membership (starting at just $35) or purchasing a brick , medallion, bench, or tree in memory of or to honor a friend or family member (tribute gifts start at $100). Call 515-795-3216 or click here for membership information.